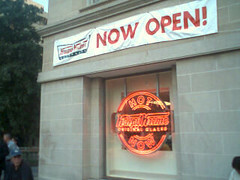 As a followup to this long-ago entry, I can now confirm that a Krispy Kreme shop has opened in Dupont Circle, Washington, DC, right outside the South Metro escalator. 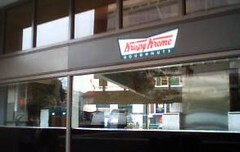 Now excuse me while I go Kreme myself. umm… that was a horrible joke. while i was in DC???? 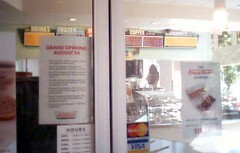 I just wanted to point out that this Krispy Kreme in Dupont does not bake its own doughnuts. The doughnuts are actually baked in the Alexandria, VA store and trucked over to DC where they are re-heated and hot-glazed.